Passive natural sounding EQ with a sharp focus on mid range frequencies. Provides a variation on the classic passive EQ designs with an improvement in choice and control in the mid range. ‘Air’ type control for high top lift/cut. 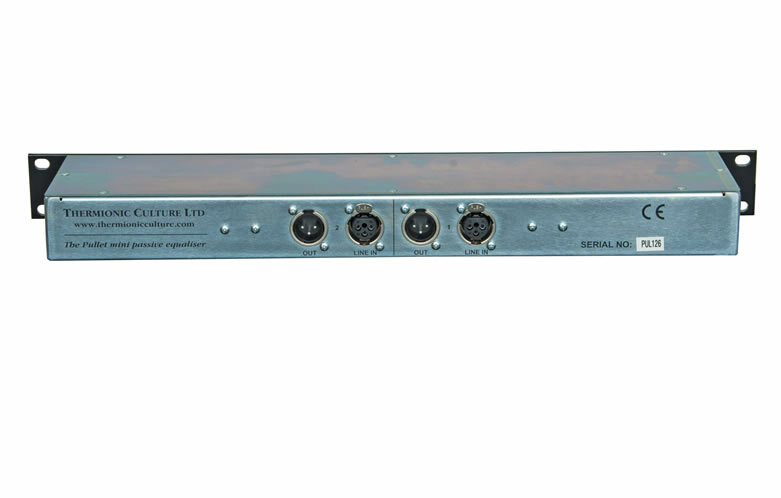 Can be used with almost any mic preamp available with a gain of around 40dB. Exceptional amount of lift (over 20dB), and cut available. Balanced” in and out on XLR connectors. 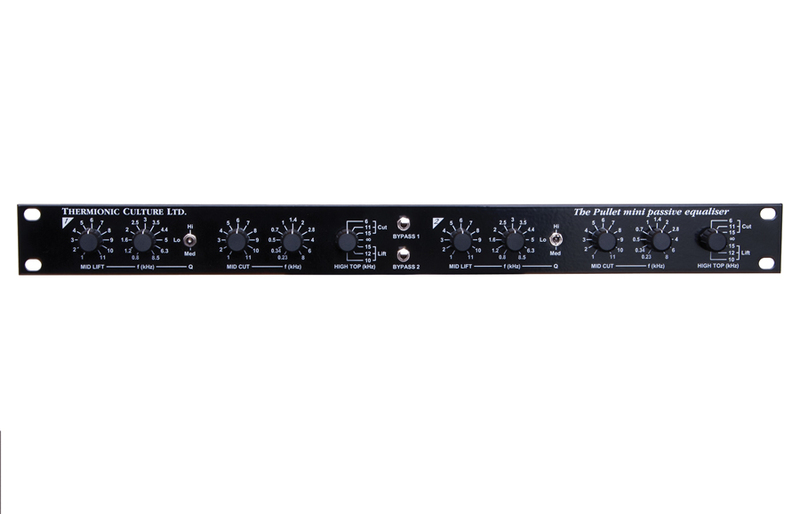 The Pullet is a passive EQ which has a sharp focus on mid range frequencies. The Pullet will provide the EQ network to a signal but will reduce the signal level so that a preamplifier with a gain of up to 40dB is needed in order to lift the signal back up to unity gain when the Pullet EQ is set to ‘flat’ or bypass. The preamplifier is used at the output of the Pullet. The fact is that most people will already have a preamplifier that can be used, either a standalone outboard unit, or a mic-preamp built into a console, so the Pullet can make a lot more use from the preamps that would otherwise be sitting around unused during a mix. 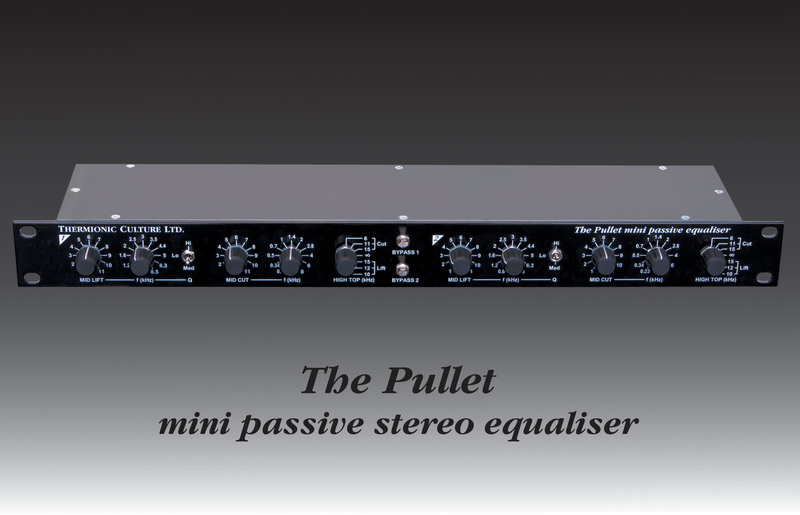 The Pullet provides a variation on the classic passive EQ designs that have proved so popular (eg. Pultec). However, there is far more control and choice in the mid range frequencies than can be found in previous designs. The Pullet can provide a variable Q boost of up to 21dB over 11 different frequencies and fixed Q cut at 11 frequencies. There is also a ‘High top’ control that provides a switched set of shelving style filters to boost or cut high frequencies. The Pullet was originally designed for use with the Earlybird 2.2 mic preamp but early on a decision was made to alter the design so that the Pullet can be used with any mic preamp available with a gain of up to 40dB. The input impedance of the Pullet is set at 10kΩ and the Sowter input transformer is utilised so that it will function normally when placed in a chain after any piece of equipment. The Pullet can produce some radical EQ curves due to the very high amount of boost and cut available but the passive nature of the EQ will always allow the results to sound as natural as possible. It is “balanced” in and out on XLR connectors. Short, high quality leads are supplied for connection to mic amps.